An educational article about the Glaucoma Module Premium Edition (GMPE) is prominently featured in the Technology to Empower section of The Ophthalmologist (March issue). The article showcases how GMPE detects the anatomical landmarks of each individual eye to provide accurate and precise measurements of the neuroretinal rim, RNFL, macular ganglion cell layer, as well as the posterior pole asymmetry. 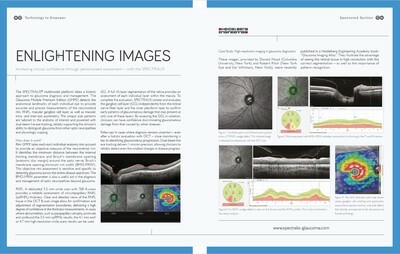 Tailored to the anatomy of interest for glaucoma diagnosis and powered with dual-beam live eye tracking, the unique GMPE scan patterns, reliably support ability to distinguish glaucoma from other optic neuropathies and physiologic cupping.